Available Colors: Frost: Green, Red, Blue or Purple. Solid: Black. Shipping Weight: Individual Poly Bag, 50 per carton @ 21 lbs. Customized 5" x 7" Spiral Pocket Notebook and Pen Item #HT-6987 is Promotional with your business logo for advertising to clients. 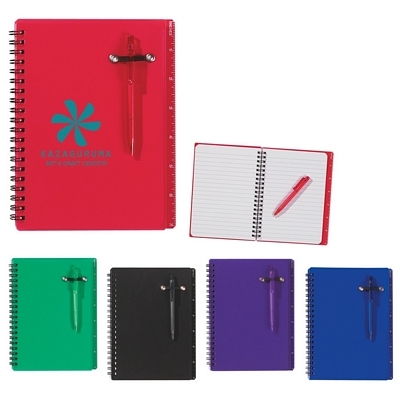 Customized 5" x 7" Spiral Pocket Notebook and Pen are decorated with No Setup Fees. 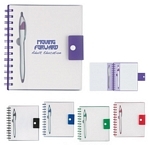 Customized Spiral Notebook With Dart Pen (Item #HT-6995) is Promotional with a Free Artwork Imprint. Promotional Notebooks like our Personalized Spiral Notebook With Dart Pen are decorated with your logo with no setup fees. Customized Stadium Cushion with Handle Item #HT-7006 is Promotional with your business logo for advertising to clients. Customized Stadium Cushion with Handle and other Promotional Stadium Cushions are decorated with No Setup Fees. Customized Foldable Stadium Seat Cushion Item #HT-7000 (Minimum Order: 120). 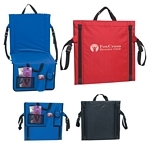 Promotional Seat Cushions like the Foldable Stadium Seat Cushion can be personalized with your business logo and with No Setup Fees. 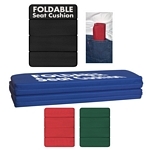 Customized Deluxe Chair Stadium Cushion Item #HT-7004 (Minimum Order: 24). 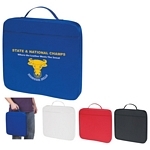 Promotional Seat Cushions like the Deluxe Chair Stadium Cushion can be personalized with your business logo and with No Setup Fees.